Turn your Digital Album into a Physical CD, and Sell it Directly on Amazon.com! How about this? You already have your music on Amazon MP3 (or soon will) for digital download, but how about making a physical copy available too? The scoop - A customer buys your album on Amazon.com, Amazon then makes a physical copy and ships it directly to them. This is a new service only from Amazon and is now available to all SongCast artists! 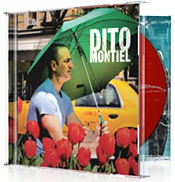 You've produced great music and designed your own artwork; now make it into a retail-ready CD with a full-color front cover, tray card, jewel case, and a beautifully printed disc face. Your CD will be professionally "shrink wrapped" and shipped directly to the customer! We already have your music, meta-data and artwork. Earn a 35% commission on every sale. Set your own selling price. Note: This is a separate service from the Amazon MP3 store. Your music will still be available for digital download on Amazon MP3. Setup cost is only $10.99 per title. Get started today!